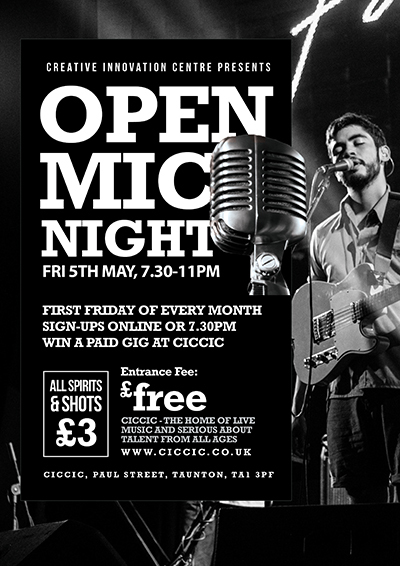 CICCIC’s Open Mic Night is a space for performers and artists to offer new ideas / pieces / songs / poems/ comedy theatre / music etc! Performers simply book a slot and perform for free and there is no admission for the audience. Working with local performers experienced or completely new we welcome cover songs, new ideas and pieces of expected and unexpected work but are keen for others in the South West community and beyond to contribute pieces. Let’s make this an exciting and vibrant space for great music, new work, collaborations, conversations and fun. Plus get a chance to win a paid gig at CICCIC – Taunton’s place for great live music from all genres. Simply fill out the form below and await our confirmation or turn up at 7.30pm for a slot. Thank You.